Have any junk comments or spam slipped through and ended up on posts? The are irritating to visitors and they can have a negative effect on SEO if there are an excessive amount. 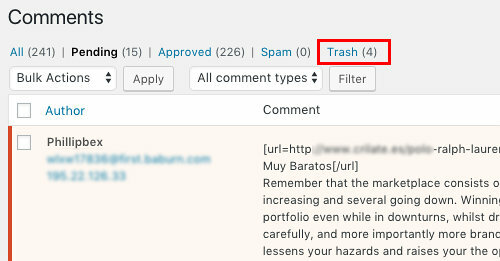 Select Comments in the sidebar in WordPress and take a look at the recent comments that have been posted on your site. Are they all ok? If there are unwanted comments, move the mouse over them and click the Trash link that appears. When comments are sent to the Trash, they are not deleted and are still stored in the system. You need to really delete them. Select Comments in the sidebar and then click the Trash link at the top. Click the Empty Trash to delete everything. Are there plugins enables that are not being used? Sometimes we install plugins, and perhaps use them for a time, but then decide to stop using them for some reason. Sometimes we get a better plugin or one that overlaps in features. Sometimes a web hosting company will include plugins when it sets up WordPress for you. These are not always needed and can be deactivated. Sometimes one plugin has features that overlap another, and one can be removed. It is important to disable plugins that are not being used. Firstly because every plugin that is active slows down WordPress and adds to the bloat. By disabling unused plugins or ones you can live without, you make your website that little bit faster and more efficient. A faster site is good for both visitors and for SEO. Select Plugins in the sidebar, click Active at the top and take a good look at what is running. Click the Deactivate link next to any you are sure you don’t need. After deactivating plugins, it is a good idea to remove them completely. This means fewer files to back up. You are backing up your site aren’t you? See this WordPress backup guide. It removes any possible security issues from the plugin and it stops notifications for updates. A plugin does not need updating if it is inactive. Go to Plugins in the sidebar, click the Inactive link and then click Delete. Your WordPress setup may have included several themes to get you started. You may also have browsed the theme gallery and downloaded some to try out. only one theme can be active, which means that there could be several other themes that are not being used. As with inactive plugins, unused themes take up space, slow down backups, generate update notices and could potentially be a security risk. It is best to remove them. Select Appearance in the sidebar and then Themes. 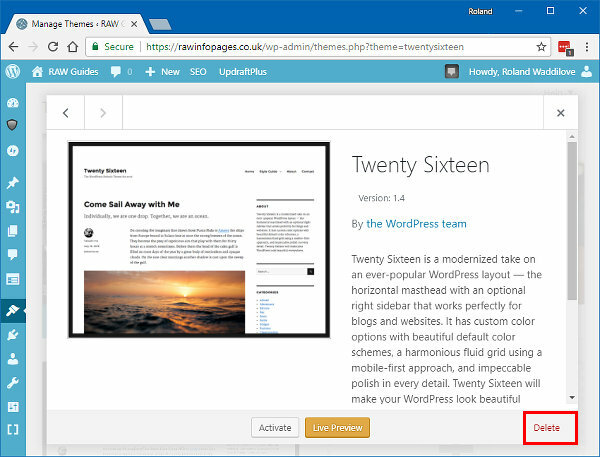 At first sight, there does not appear to be a way to remove a theme once it has been installed in WordPress. You must click a theme thumbnail to open the details view and then down in the bottom right corner is a Delete link. Use it to remove the theme. Have you added any extra users? Select Users in the sidebar and take a look. You may have added someone who helped build your site, or helped to fix a problem. You may have had contributors or guest posters who had accounts. 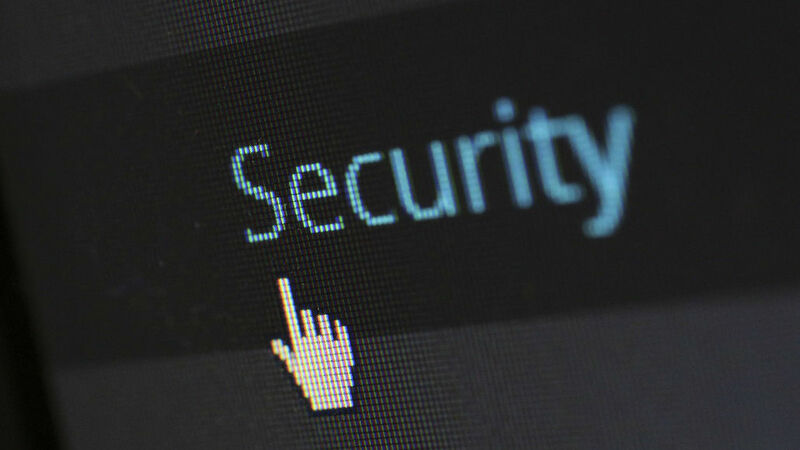 These are security risks. At the very least, downgrade them to Subscriber status, which gives them zero power to change anything. 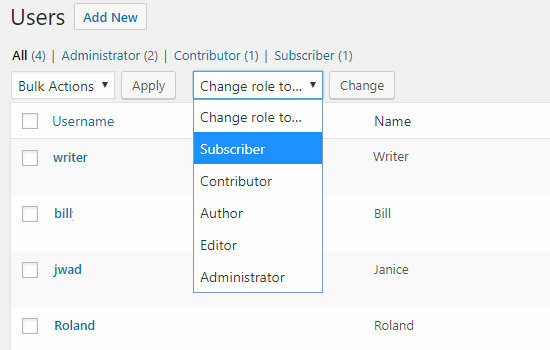 Select a user and then click Change role to… and select Subscriber. You don’t need to clean up WordPress very often and perhaps a couple of times a year is sufficient. Your site will be better for it. 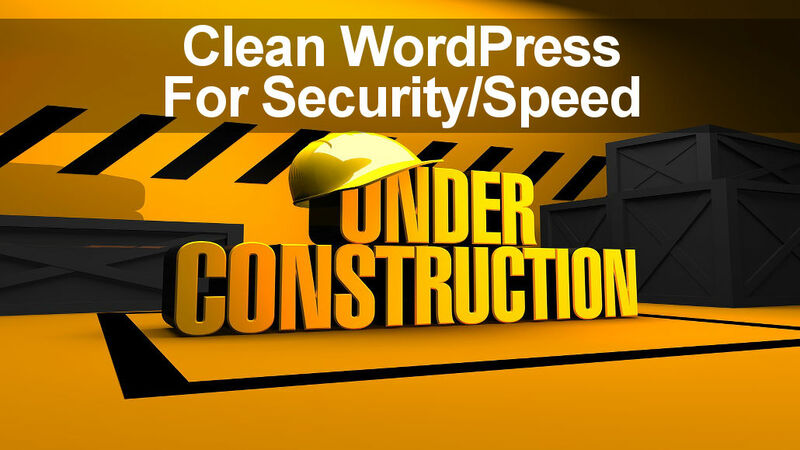 Cleaning the WordPress unk always help to keep the blog load fast and also save web hosting space. I like the idea of deleting unused themes and unused plugins.